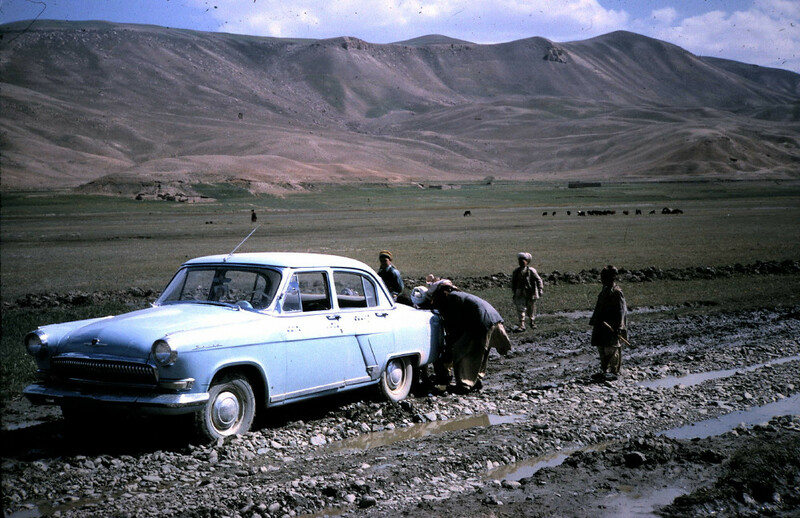 I’m struck by the beauty of Afghanistan I’ve seen in my mom’s slides. When my mom was in Kabul, traveling alone in 1965, she met another solo traveler, a woman from the Philippines. Her new friend was about to leave Kabul for Kuwait City, but my mom had her heart set on seeing the giant Buddhist statues in Bamian. As it turned out, this new friend was acquainted with a French journalist who just happened to be headed to Bamian, too. So my mom and the French journalist hired a car (the Russian beauty on the left) and driver and headed west to see the giant statues (later destroyed by the Taliban) and cave paintings. Along the way, the car broke down. And as you can see in the photo, some nearby farmers came to their rescue. 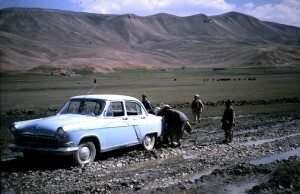 You probably wouldn’t want to have car trouble in Afghanistan now, but it was a different story back then. Even for a 23 year old woman traveling alone.